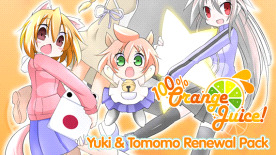 100% Orange Juice - Yuki & Tomomo Renewal Pack adds 2 new playable character combinations from developer Orange Juice's games. Meet Yuki (Dangerous), who disrupts the play by seeking wins through trap use, and a brand new version of the game's end boss: Tomomo (Casual) who can transform to Tomomo (Sweet Eater) if she can just bother to get up from the bed.Character Pack includesYuki (Dangerous) from 'QP Shooting - Dangerous!!' Tomomo (Casual) & Tomomo (Sweet Eater)New, unique Hyper Cards and mechanics for both characters to bring chaos to the battlefield with!New music tracks play as Yuki (Dangerous) and Tomomo's themesThe new characters are designed by Orange Juice's original staff for the game's English Steam release, with character and card artwork by Hono.